A San Jose police officer has filed a claim against the department and the city, alleging discrimination and harassment at the workplace and in public. Officer Nabil Haidar, who is Muslim, said he endured years of insults, such as being labeled a terrorist by his fellow officers. The 21-year veteran said the insults started after 9/11. "It started with 'El Taliban.' Are you wearing a suicide vest?'" Haidar said about the labels. The Muslim immigrant from Lebanon said he complained to the command staff, but nothing happened. So he filed a claim against the city and the department, the precursor to a lawsuit alleging racism, discrimination and harassment. A San Jose police officer has filed a claim against the department and the city, alleging discrimination and harassment at the workplace and in public. Damian Trujillo reports. "When somebody chips at your soul day in and day out, that’s torture," Haidar said. His wife, Sheila, said she’s watched her husband endure the harassment every day. "We are angry and in shock," she said. The couple believes there's systemic Islamaphobia in the department. San Jose Police Chief Eddie Garcia defended the SJPD and touted his department’s diversity up and down the ranks. "I think that's an unfair label for the police department," Garcia said. "When allegations such as these and incidents such as these occur in this department, they’re taken extremely serious and dealt with seriously as well." 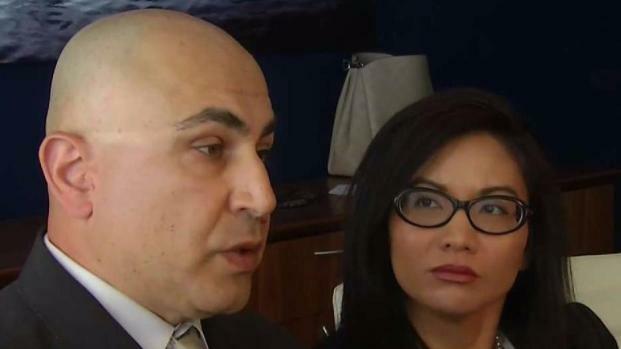 Police sources told NBC Bay Area that Haidar has dished out some of the same insults he's now accusing others of making and was disciplined for those. Haidar denied those allegations. "What did I say?" Haidar said. "Let them come forward and say what I said." NBC Bay Area obtained a part of the report by the San Jose's Independent Police Auditor that said a 2016 bodycam video showed "Officer H," who three sources said was Haidar, using "several unflattering racial stereotypes related to Asians." Haidar's lawyer did not deny the report and said the complaint, made by a citizen, was investigated and Haidar received a one-week suspension. "This is the only sustained complaint against Officer Haidar in his 21-year career with the San Jose Police Department. In contrast, he has received many, many commendations during his successful career. The incident in question is wholly unrelated to Officer Haidar’s claim against the City of San Jose and the San Jose Police Department," attorney Randall Strauss said in a statement to NBC Bay Area. Strauss said the details of the Haidar's disciplinary action could only have come from inside the SJPD because the details are confidential and can only be released by a judge. "Leaking these details appears to be a cynical ploy on the part of someone inside the San Jose Police Department to deflect attention away from the serious racial and religious harassment and discrimination suffered by Officer Haidar," Strauss continued. The Haidars said they fear retaliation from the officers after going public with the discrimination claim, saying that other officers may not want to respond to to an emergency call with him. Sgt. Paul Kelly of the San Jose Police Officers Association said, "There is no doubt in my mind a San Jose police officer would respond as fast as he or she could" if Haidar were to call for backup on the radio.